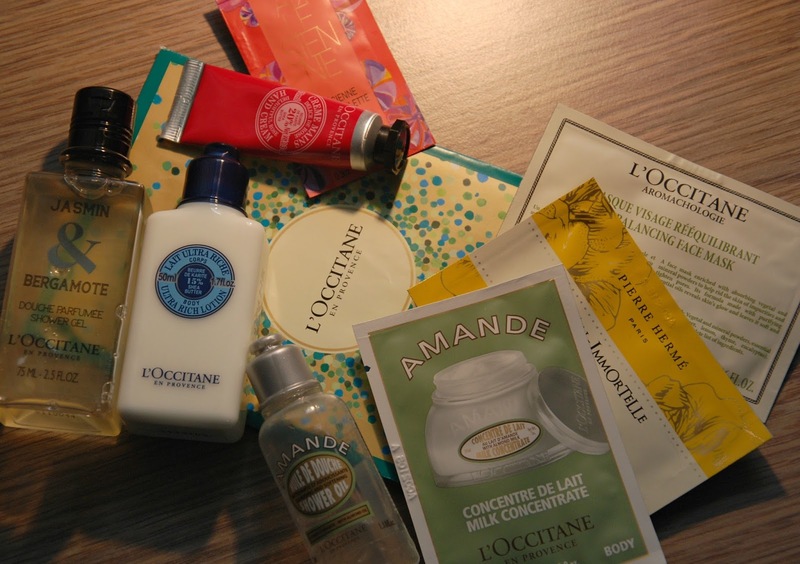 A few weeks ago I got to try a few products of the brand L'Occitane En Provence and I got really excited about it. Their natural products give you a feeling of well-being and a bit of luxury too- which means they are great for having a nice pamper night now and then! There is everything you need to treat your entire body: face masks, shower gel and shower oil, body lotion, hand cream and perfume! The delightful rose hand cream is so tiny and cute and just fits into every bag (or even pocket! ), which is great because having a hand cream with you when out in winter is really important and useful. Unlike the body lotion, this is a rather thick cream but also soaks into your skin quickly and well. The smell is actually very intense, and I'm not the biggest fan of rose-scented products, but when my hands get dry and sore I don't really care about the smell of the cream as long as it helps! The parcel also included two little sachets of perfume, which I actually liked-it's sweet and has a floral scent at the same time. One sachet could be used twice I guess- but it's a nice sample to try out before buying a whole bottle of perfume that you maybe wouldn't like in the end. The Jasmin&Bergamote shower gel cleanses the skin, leaving it delicately fragranced with a sensual and luminous scent. I absolutely love the smell of it- it stays on for so long that it almost seems like I'm wearing perfume after showering. 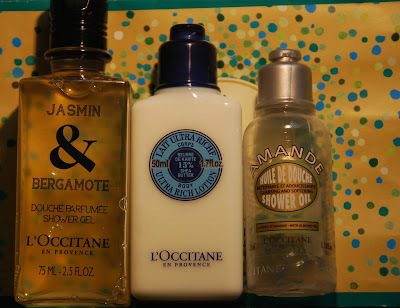 Also, the cleansing and softening Almond shower oil, which is already empty, was a product I've absolutely loved! The consistency is a bit weird because it changes into foam when in contact with water. I've never used anything like it before but I was impressed! My skin was left very soft and silky and again, the smell was just beautiful! And to finish off the little treatment, the ultra rich body lotion can be used. It's a pretty liquid lotion and you don't need a big amount to ensure your body is being moisturised well. The only thing I don't like about this is the smell. It has a heavy, "granny-like" cream smell, that I don't really enjoy, but I'm sure the lotion itself is very good! And then I also got two more body moisturisers and a face mask that I haven't used yet but can't wait to do so very soon! 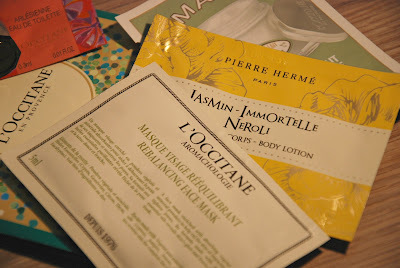 The Jasmin-Immortelle Neroli Body lotion and the Almond Milk Concentrate sound so nice smelling that I am actually a bit angry with myself that I haven't used them yet, but I couldn't find the right time to take photos of all those beauties, so I kind of couldn't have used them yet either. I will probably use the Rebalancing Face Mask later today to prep myself a bit before another week of uni starts. I've been a bit ill since Friday morning and even had to call in sick at work yesterday. which gave me a day to rest without any stress really. I did study though! I think after those 3 days of feeling quite miserable, I deserve a little pamper evening before all the busy days start again!